1. The term "tongue" is often used in the New Testament describing real languages (Revelation 5:9; 7:9; 10:11; 11:9; 13:7; 14:6; 17:15). 2. The adjective "new" is most appropriate for describing real languages (Mark 16:17). Tongues were the God-given ability to speak in a language that was totally new to the speaker (i.e., a foreign language). How could ecstatic utterances be thought of as being "new"? 4. The adjective "other" is most appropriate for describing real languages (Acts 2:4; 1 Corinthians 14:2l; Isaiah 28:11). These are languages other than and different from the person’s native tongue (i.e., foreign languages). In what sense could ecstatic utterances be considered "different"? 5. The tongues of Acts 2:4,11 are clearly identified in Acts 2:6,8 as real languages (dialects). 6. The tongues in the book of Acts were not meaningless utterances, but they were means of conveying a meaningful message (Acts 2:11; 10:46). Likewise the tongues in 1 Corinthians communicated meaningful content. Acts 2:4-"the great things of God"
Acts 10:46-"magnifyiilg God (proclaiming God’s greatness)"
Thus, tongues in, Acts involved meaningful doctrinal content, not meaningless and empty gibberish. 7. 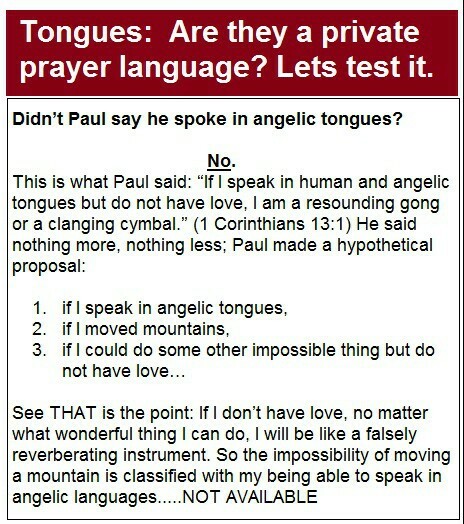 The expression "kinds of tongues" is understandable only if tongues were real languages (1 Corinthians 12:10,28; cf. 1 Corinthians 14:10). Any linguist knows that the three thousand languages of the world are grouped into many classes or kinds. But could it be said that there are kinds of ecstatic utterances? 8. The fact that tongues could be interpreted demands that tongues be real languages (1 Corinthians 12:10,30; 14:5,13,27-28). Interpretation necessitates meaning! Meaningless utterances cannot be interpreted. How can one give meaning to something that has no meaning? How can one give sense to nonsense? In Chapter 5 we gave the example of two songs sung around Christmas time: 1) "Gloria in Excelsis Deo" (this can be translated--"Glory to God in the Highest"; 2) "FA LA LA LA LA, LA LA LA LA" ("Deck the Halls")--this cannot be translated. It is meaningless syllables. 9. 1 Corinthians 14:10-11 is clearly depicting real languages. 10. Tongues-speaking is said to consist of words, which would be possible only if tongues were real languages (1 Corinthians 14:9,19). 11. The tongues mentioned in Isaiah 28:11 (cited by Paul in 1 Corinthians 14:21) were real languages. 12. The article of previous reference in I Corinthians 14:22 ("the tongues are for a sign") proves that the Corinthian tongues (verse 22) were the very same thing as the Isaiah tongues (verse 21), namely, real languages. A careful reading of the Bible examples, puts tongues in the third category, even down to the dialects in which the hearers understood what was said by the speaker. (Acts 2:8 dialecto). ...significant, because how one defines the New Testament gift of tongues significantly influences his position in the larger continuationist/cessationist debate. Those who limit tongues to verifiable and translatable languages (Carson’s third category) often reach cessationist conclusions, whereas those defining glossolalia as something broader (either of the first two categories) often embrace forms of continuationism. The history of the Pentecostal use of tongues is also of interest. In the early 1900's when tongues first we re-inflamed, so to speak in their circles, Pentecostal brethren went into the foreign fields expecting the gift to be available and present. But in reality, their experiences led them to disappointment, as the speaking in the native language, unstudied and unlearned by them, didn't come to fruition. It was a great failure. The expectation to be able to speak in unknown languages (valid and known ones) did not happen. Soon thereafter the meaning of tongues was reinterpreted into today's more common glossolalia and gibberish, and we see the fruits thereof on a massive scale. So tongues from a biblical perspective were first "expected" to be known languages, and when that failed, they morphed into private prayer languages and other nonsensical practices. And this all ties into the continuationism/cessationism argument with regard to the sign gifts.